Limited to a run of 50 guitars, the new Dweezil Zappa Private Stock semi-hollow model features a unique Custom 24 mandolin shape and is the modelled after the guitar Dweezil designed with the Private Stock team. The dramatically different shape of the mandolin inspired body is a departure from any body shape PRS has ever created, and the rowdy bass and treble clef inlay motif pays homage to the Zappa family legacy of eclectic playfulness. Dweezil’s personal model and the limited run of 50 are, however, unmistakably PRS. “It was really fun – and easy – to work with the team at PRS. I spoke with them a few times at various stages of the instrument. They were very helpful and knowledgeable. It’s a great experience to build something from raw pieces of wood into the finished instrument. I never had the opportunity to do that before,” said Dweezil. Features include a one-piece curly or quilted maple Private Stock top, ribboned mahogany back, ebony fretboards, 24 fret pattern neck with a 25″ scale length, a stoptail bridge or tremolo, and an exclusive thin, semi-gloss nitro finish with an array of Private Stock colours to choose from. 57/08 pickups add to the dynamics, and are rounded out with vintage tuners, a 3-way toggle and coil tap. “The guitar has a beautiful natural sustain and fantastic playability all the way to the 24th fret. The shorter lower horn gives you great access. It’s one of the easiest guitars I’ve ever had the good fortune to play. The pick up configuration offers some really nice tonal variety as well. 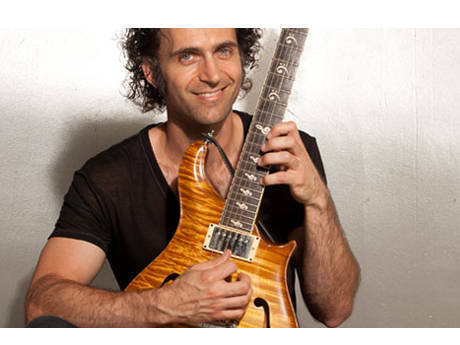 The out of phase quack is really cool,” said Dweezil.